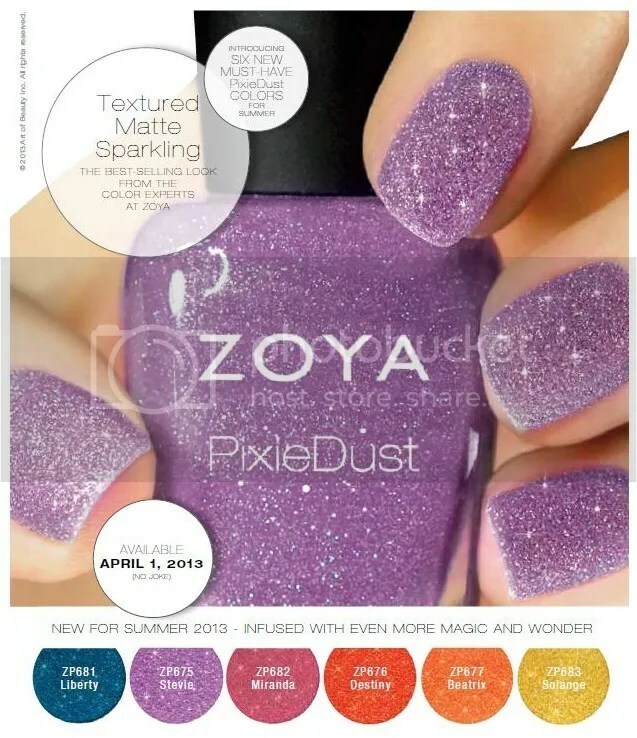 First Look: Zoya PixieDust Collection Summer 2013!!! ZP683 – Solange: EXCLUSIVE PIGMENT!!! Gold Metal sparkle, exclusive Zoya PixieDust Matte Sparkle formula. ZP677 – Beatrix: Tangerine Metal sparkle, exclusive Zoya PixieDust Matte Sparkle formula. ZP676 – Destiny: Coral Metal sparkle, exclusive Zoya PixieDust Matte Sparkle formula. ZP682 – Miranda: Rose sparkle, exclusive Zoya PixieDust Matte Sparkle formula. ZP675 – Stevie: Violet sparkle, exclusive Zoya PixieDust Matte Sparkle formula. ZP681 – Liberty: Blue sparkle, exclusive Zoya PixieDust Matte Sparkle formula. I am so excited about this line!!!! !My nickname is Stevi so that purple is SCREAMING my purple-loving name! What shade are you most excited to get your hands on? Ah! Hurry up April!